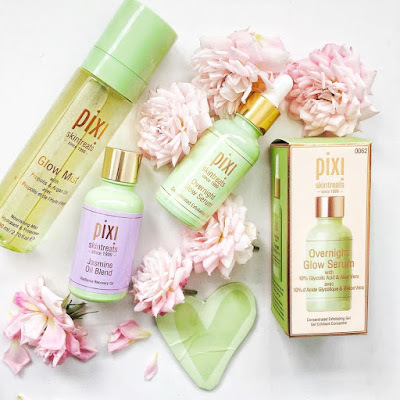 I can never have enough Pixi skincare, I just love their products a lot and its always such a pleasure to use them. They sent me a box with several skin treats and I was surprised to see that all of them are perfect for my skin type -mostly dry and sensitive! I dont know if this is just a coincidence or if they actually took in consideration my age and my skin type and skin issues. Pixi Glow Mist Propolis and Argan Oil is one of the most popular Pixi products I have seen on social media and until today I had no idea I can use this mist on my hair too. I was already familiar with this product, this is one of my favorite face mists to spray on after I do my makeup and also before I go to bed. I just love how it smells, is not floral is quite herbal but very calming. 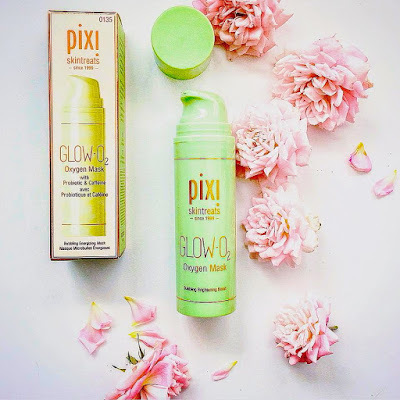 This Pixi Glow Mist is enriched with 13 natural oils plus propolis, aloe vera and fruit extracts. This is definitely the most hydrating and nourishing mist I ever head. From all the Pixi products that I ever had this one is definitely my absolute favorite; the Rose Caviar Essence comes on 2 and the Jasmine Oil Blend on 3rd place in my Pixi skincare top. Pixi Overnight Glow Serum with 10% Glycolic acid and Aloe Vera is a concentrated exfoliating gel, designed for a nightly treatment. It can be used as skin booster to reveal a more even and radiant skin tone overnight but also as a blemish treatment. The Glycolic acid will stimulate cell turnover while Aloe Vera heals & soothes. Cucumber fruit extract, lecithin and glycerin are also skin loving ingredients and they help calming and relief puffy skin. I use this serum 2 or 3 times a week and I noticed that my skin texture is more smooth and brighter. I love that it has Aloe Vera because for me this is a miracle plant. I was reading that some people find this product to be sticky, I didn't, but I also use very little of it and not 5 min before I go lay down on my pillow in bed. You need to put PM skincare like 30 -40 min before you actually let you face touch the pillow. This product comes with a dropper and even if I am not bothered by it I do agree that maybe it would have been better if instead of the dropper there was maybe a pomp. The reason why I dont mind the dropper is because it gives me the exact amount of product I want to use. The texture is indeed a thick one just because is gel, is not oily and the best part is that it doesn't live a sticky film behind, I think it absorbs into my skin in less than 10 min. Another thing that I really wanted to mention about this product is the small golden lid that you can put back and use it when you travel, brilliant idea -super useful ! Usually when I use such an exfoliating product with 10% Glycolic acid my skin gets very red and even more dry and it starts to peal, mostly around my chin and cheeks, but I have not experienced any redness or inflammation or dry skin while or after using this serum. My advice is to not abuse acids in general, dont go for this type of serums every night and avoid sun exposure. Pixi Jasmine Oil Blend is another favorite product of mine, it smells so divine! I can't say in words how much I love this product. It's so exquisite and so luxurious and it doesn't cost a fortune, it costs somewhere around 36 euro for 30 ml. The best part about the Pixi Jasmine Oil Blend is that it can be used daily and you can mix it with other skincare products like cleanser or moisturizer. This is the perfect product if your skin suffers from loss of moisture and dullness, its so calming and it helps to restore skin and balance it. Like I said it does smell divine, if you like warm floral scents. Some people might find it a little bit overpowering, I personally love the way it smells and I wouldn't change a thing about this product. I really believe that this oil blend will definitely get some beauty awards ! The luxurious formula is infused with jasmine flower extract, evening primerose and grapeseed oil making it rich in omegas, antioxidants and vitamins. Pixi Glow O2 Oxygen Mask is a bubbling energizing mask with a gel texture. After you smooth the gel onto your face it will become to bubble and a slight tingling sensation is possible, but personally I did not experienced any tingling sensation while or after using this mask. This mask has oxygen complex, vitamins, red ginseng (brightens & clarifies), antioxidants, caffeine (de-puffs & energies) and probiotic (lactococcus ferment lysate to help generate skin barrier), lactic acid, laveder oil, lemon peel oil, bergamot fruit oil, orange peel oil, licorice root extract, niacinamide - lots of skin loving ingredients ! No fuss, no time consuming, no pulling on skin to remove it, no dry skin after, no irritations, no redness, just very happy skin ! This product is made in Korea and it has 50 ml and expires in 12 months after opening. Pixi beauty products are absolutely my favorite! mine also,they are so good ! I love the sound and look of this Pixi Skincare Products. I will be looking out for them. I also like a lot hoe they look, everything is so cute ! I need to try these Pixi products. I have read so much nice feedback about them and I have yet to get my hands on one. Thanks for the review. The gel Oxygen mask will be the first one I'd get. I am really happy to hear you liked this review, thank you ! sounds like a great beauty product and thanks for your review. I need to try these Pixi products. I'm so exited to try Pixi products! I'm waiting em in this days!